There’s a great deal to say in favor of a one-pot dinner. It is a delicious blending of different tastes and flavors, with a tempting plate appeal. When each ingredient is individually cooked and set aside, then reassembled at the end, which is the way I prefer a one-pot dish to be handled, you have far better control over the final result. The chances that any one ingredient is under or overcooked is reduced to a minimum. 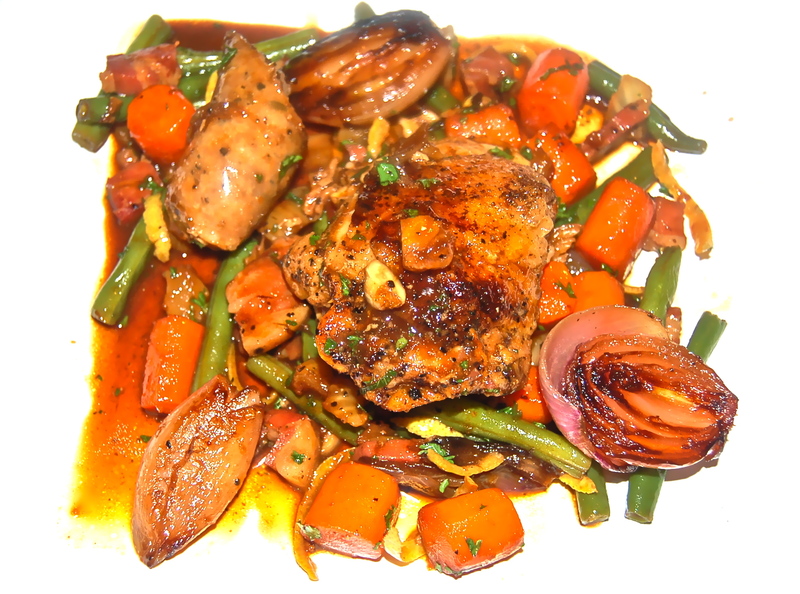 In this take on Coq au Vin, a Riesling Wine substitutes for the usual Red. 1. Position a rack in the bottom third of the oven & heat to 300°F. 2. Heat 2 TB of the EVOO in a large Dutch oven over medium-high heat. Season the six Chicken Thighs with 1 Salt & Pepper. Arrange the Thighs skin side down in the pot in a snug single layer. Sear, turning once until the skin has taken on a deep golden brown, 10 to 15 minutes. Transfer to a plate. Add the Sausages (optional) & cook until almost done. Set aside. 3. Cook the Pancetta in the same pot until well browned, 5 to 8 minutes. Transfer with a slotted spoon to paper towels to drain. Pour off & discard the fat. Set aside. 4. Heat the remaining 2 TB of EVOO in the same pot over medium-high heat. Cook the Shallots until tender & richly colored. Set aside. 5. Cook the Carrots & the Fennel, stirring occasionally, until lightly browned, about 7 minutes. Add the Garlic, stirring frequently, until its aroma subsides, 1 to 2 minutes. Set aside. 6. In a soup pot, parboil the Green Beans for 5 minutes, immediately immerse in cold water, drain on paper towels & set aside. 7. Tie the Parsley, Thyme sprigs, & Bay Leaf together with twine (or tie them in a small cheesecloth sachet). Add the herb bundle to the pot, along with the Riesling Wine. Simmer briskly, scraping the bottom of the pot to loosen the brown bits. Add the broth & return the Chicken, Pancetta & Sausages to the pot, arranging the Chicken & Sausages in a single layer. Bring to a simmer, cover & transfer to the oven. 8. Braise in the 300 degree oven for no more than 10 minutes. all the meats should be slightly undercooked. Return all the cooked vegetables to the pot with the Chicken & Pancetta. Heat through. 9. With a slotted spoon transfer the Chicken, Pancetta, Sausage & all the Vegetables to a large bowl or serving platter & tent with foil. Discard the herb bundle. Bring the sauce to a boil over high heat & reduce to 2 cups, about 15 minutes. Stir in the Lemon Zest & a final generous seasoning of Salt & Pepper. 10. To serve, add a hefty portion of Chicken, Pancetta, Sausage & Vegetables to a dinner plate, spoon on the reduced sauce, & sprinkle with chopped Parsley. This is a very nice post and I so agree with your “decontruction” technique. This is the manner in which I like to prepare my chicken fricasee. Every ingredient is at its best when the dish is served! Thank you Mel, The concept of individual cooking and setting aside, happened by accident a while ago. It allows me better control and that’s vital. I appreciate your following my progress.